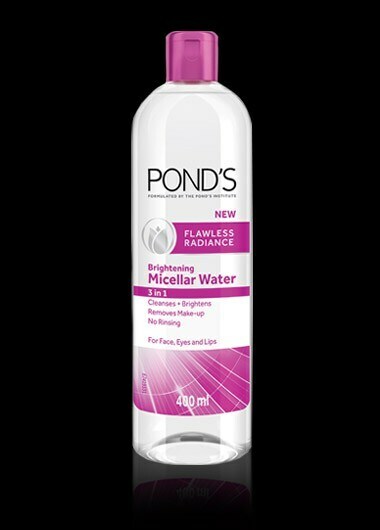 A first of it's kind innovation for the POND's Institure, New Flawless Radiance 3-in-1 Brightening Micellar Water cleanses and brightens skin and removes makeup with no rinsing required. For face, lips and eyes. Best suited for all skin types. A first of it's kind innovation for the POND's Institure, New Flawless Radiance 3-in-1 Brightening Micellar Water cleanses and brightens skin and removes makeup with no rinsing required. For face, lips and eyes. Aqua(Water), Hexylene Glycol, Glycerin, PEG-6 Caprylic/Capric Glycerides, Phenoxyethanol, Cetrimonium Chloride, Hydroxyethyl Urea, Tetrasodium EDTA, Propylene Glycol, Citric Acid, Cetylpyridinium Chloride, Potassium Chloride, Sodium Chloride, Niacinamide, Panthenol, Urea, Ammonium Lactate, Ethanolamine. Apply solution to a cotton pad. Gently wipe all over until skin is completely clean from makeup and impurities. Use daily - AM and PM.